The Washington Post recently ran a story on the shortage of referees in youth sports. It spotlighted several former game officials recounting their many negative experiences. These included instances of verbal abuse by players, coaches and parents, feeling threatened physically, and lack of support from league and school administrators. One D.C.-area baseball official assigning group is reporting it’s lowest number of umpires in over 25 years. Only 50% of their first-year umpires return to the job. About 20% of those officiating for five to seven years come back. According to the National Federation of State High School Associations, just two out of every 10 officials across all sports return for a third year. Youth soccer, in particular, suffers from a decline in referees, even as player participation continues to rise year after year. Incidences of red cards remains static. But the number of red cards for filthy and abusive language, often directed at officials, has doubled in the past year. There’s no reason to expect this trend to change any time in the foreseeable future. The increasing referee shortage means even more game cancellations in the future than are already being experienced. High school assistant football coach Scott Hartman told of being verbally attacked by players and their coach following a call he made. After the game, parents and fans hurled insults at the other officials and him. The school’s director of student activities escorted them to their cars, but chastised the referees for missing several possible fouls by the opposing team. You’re the exact reason that we’re losing referees, and you’re the reason that parents and coaches are out of control,” Hartman told him. Hartman points out that there are schools that make maintaining decorum a priority. But many administrators are obviously more concerned about wins and losses, not holding coaches accountable for poor behavior. Virginia’s Commonwealth Soccer Officials Association (CSOA) conducted inspections at Northern Virginia high schools. Loud vocal disapproval was observed in 85% of the 42 matches observed. Of those, profanity by spectators was involved in 20%. Not surprisingly, female officials suffer all this and more. Many say they encounter sexism at nearly every event, are spat upon and called whores. “I’ve been called that and worse in at least a dozen languages” said long-time soccer official Thea Bruhn. Officiating organizations are accused of encouraging referees to tolerate behavior by fans, players and parents. Other say coaches even dictate to officiating organizations which referees will work certain games. Other factors include travel leagues that are full of aggressive parents making demands as they push for college scholarships. And young athletes observe admired professional players berating referees and exhibiting poor sportsmanship. To participate in games, umpires and referees frequently have to leave their day jobs early and travel good distances. They often return home lateat night. Pay for youth rec through varsity-level leagues ranges from $25 to $65 per game. It’s no wonder many are deciding they’re no longer willing to sacrifice their time and energy when they’re shown so little regard. We encourage officials to read Referee & Umpire Insurance. For more information or quote on Referee & Umpire Insurance please call us at (800) 622-7370. Source: Nick Ellerson. 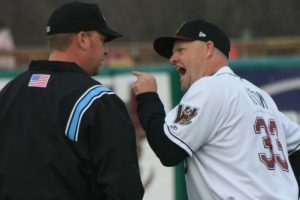 “Verbal abuse from parents, coaches is causing a referee shortage in youth sports.” washingtonpost.com. 16 June 2017.